Can career mums have a fulfilling career and a happy family? Director, strategy expert, actuary, former General Manager at the Commonwealth Bank and mother of three, Nicolette Rubinsztein experienced the tough journey of juggling motherhood and her career. Both were important to her, but the status quo was brutal. 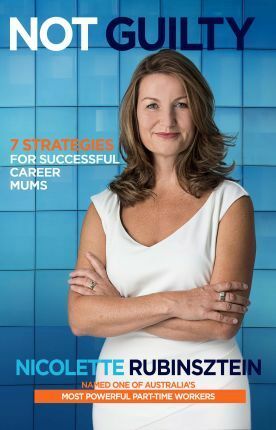 By applying the same strategic rigour she used in business to her life as a career mum she learned how to genuinely ‘lean in’ to her career AND enjoy raising her family. In Not Guilty, Nicolette gives career mums the practical tools to approach their work and life through the lens of strategy and business decision-making rather than emotion and guilt.Learn why flexibility is nirvana for career mums, how to get a part-time position, getting on the same page as your partner, curating your “childcare jigsaw”, the importance of outsourcing and how to have a good relationship with your boss. Structured according to the McKinsey 7S strategic framework, one of the most well known strategic frameworks used for business, Not Guilty is a call to arms and saving grace for women who want to make career and motherhood work, but don’t know where to start. Nicolette Rubinsztein is an experienced wealth management executive and strategy expert. She was the General Manager of strategy for ten years at Colonial First State before being named the General Manager, Retirement & Advocacy at CBA Wealth Management. An advocate for mother and work life balance, in 2014 she was named one of the top 10 powerful part-time workers in Australia by Business Insider, and one of the top 31 by Women's Agenda. A mother of three, Nicolette is a qualified actuary, holds an executive MBA from the Australian Graduate School of Management and served as a director on the Association of Superannuation Funds of Australia (ASFA) for eight years.